Last week, Quora contributor and former NASA astronaut Garrett Reisman exlained what it is like to live in space. So naturally, we wanted to know what it was like when he came home. But you do go through a strange adaptation process when you return to Earth. The first thing you notice is that everything seems really heavy. After 95 days on the International Space Station, I returned to Earth in the space shuttle Discovery. I took off my helmet, and it felt like I was holding the anchor of the U.S.S. Nimitz in my hand. Oh great, I thought, how am I ever going to brush my teeth? The brush will be too heavy! 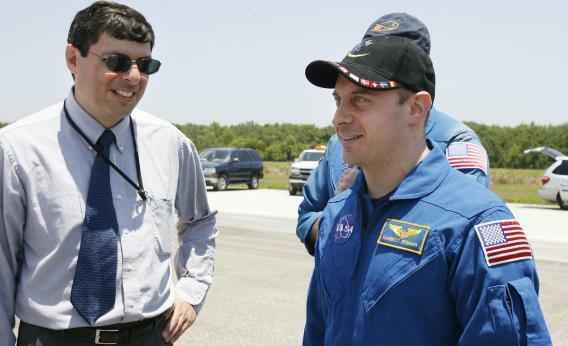 Garrett Reisman (right) speaks to Chris Scolese (left), NASA Associate Administrator on June 14, 2008, after his two-week mission to space. After this, he went for a cheeseburger. The next thing you notice is that your vestibular system is all messed up. Just sitting up took a lot of concentration. After about 15 minutes, I was able to stand, but I would have keeled right over if there weren’t a lot of things to hold onto in the middeck of Discovery. You see, your brain is remarkably adaptable. After just a few days in space, it figures out that your inner ear is producing nothing but garbage signals and so the brain turns the gains of those signals way down in its Kalman filter and cranks up the gains on your visual sensors, the eyes. Then all is well, until you come back to Earth. Now you need your inner ear sensor again, but the brain is still filtering it out. Gradually the brain re-calibrates, but it takes a while. After about an hour, I was able to walk around the Shuttle on the runway at the Kennedy Space Center. I was even able to go out to a local bar with my crewmates, and I managed to eat half a cheeseburger and half a beer. On my second flight, STS-132, which was only about two weeks in duration, we went to the same bar, and I had a whole cheeseburger and a whole glass of beer. So when people ask me what was the difference between a long-duration spaceflight and a short-duration spaceflight, I have a quantifiable answer: a half-cheeseburger and a half-beer! What would astronauts do if their faces itch when they’re in spacesuits?